Oh how I love Indian food…I think I can write a book on that if I’m asked :) I grew up on Japanese curry that is made with meat and vegetables, seasoned and finished with a roux which comes in portioned packets. This dish has been at the top of the list of many Japanese people’s favorite foods for as long as I can remember. When I was little, I loved it so much. Just like most of the other kids, I didn’t even mind eating school lunch if it’s on the menu. (Although school lunches were so well-planned taking nutritional balance into consideration, I was too small to appreciate the luxury of that.) It wasn’t until I was over 20 years old that I was introduced to real Indian curry. I guess there is a good chance that the curry I ate at Indian restaurants in Japan were flavored in the way more approachable to the people there than authentic ones. However it was a shock to see how different Japanese and Indian curries were in texture with a little similarity in flavor. After this first state of shock, I got super curious how to blend all the spices and combination of ingredients. I still think the one I made many years ago, cooked beef with 12 herbs and spices is my championship curry…yeah it came out great in a lucky way…mumble, mumble, mumble. I guess that is enough of nostalgic talk for now, hehehe. 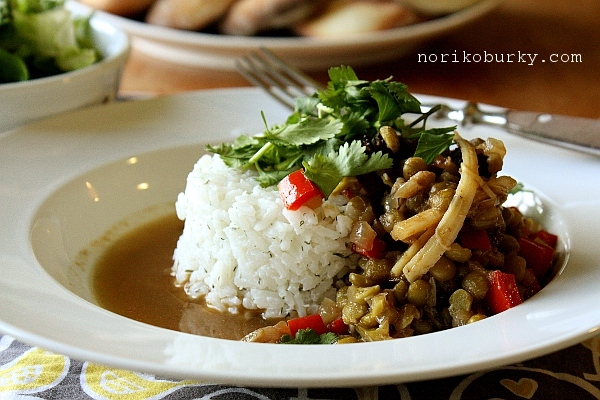 Now let’s talk about the curry that comes on our table these days. Having a no-meat eater husband and a son for whom every tiny bit of spicy kick is still a challenge, I make a mild and vegetarian-side curry with some room for me to play around with what ingredients to use. Today’s spotlight is on Hearts of Palm. What a fun and useful ingredient it is! 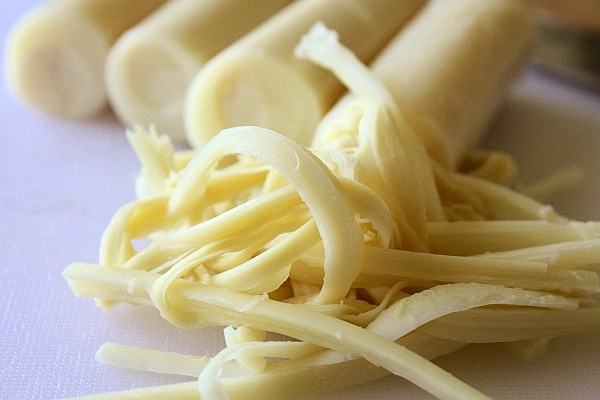 It resembles string cheese and comes apart just like it, just far more delicate. Encountering a food like this makes me wonder how much more stuff I may be missing in the world and simply drool over yet unknown tastes and textures. 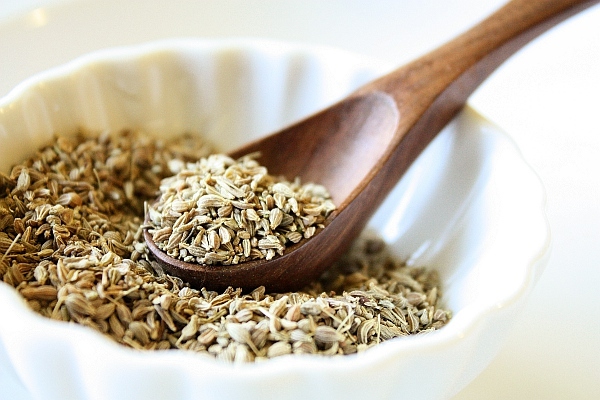 Anise seeds are, I personally think, an underestimated spice in cooking. Its elegant smell caught me the instant I first experienced it and has hooked me for life. It doesn’t cook tender or disappear in the process, rather insists on its existence with it’s crunchy bite among the other ingredients. Not to mention the flavor it gives to a dish, I may have been mesmerized by its stubborn attitude. 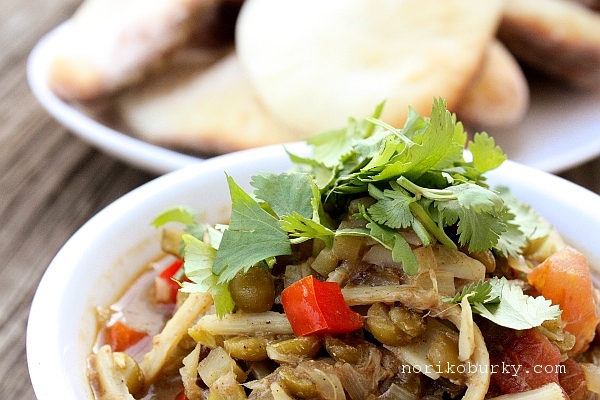 Healthy and rustic curry made with vegetables, Hearts of Palm and split green peas. In a pot, bring split green peas and water to a boil. Turn the heat down to low-medium, simmer for 15-20 mins or to your preferred tenderness. Drain. Meanwhile, drain Hearts of Palm and tear with your finger tips. Heat canola oil in a frying pan, add onion, garlic and ginger, cook until onion is transparent. Add ground cumin, coriander, garam masala and anise seeds. Cook for another 2 mins. Add vegetables, cooked split green peas and teared Hearts of Palm, stir well to combine. Season with salt and pepper. Pour in water and add vegetable bouillon and soy sauce. Stir well. Cover and simmer over medium heat for about 15 mins or until vegetables are tender. Add salt and pepper again if necessary. 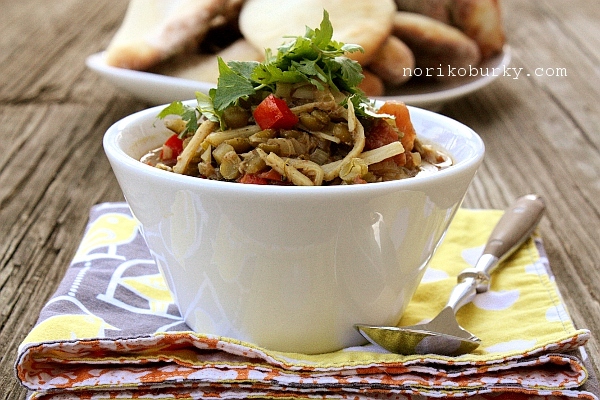 Serve with chopped cilantro. We had dill & yogurt rice with the curry. Since I had run out of basmati rice, I used long grain rice instead. Just cook the rice it in a pot, mix in dried dill, Greek yogurt and garlic paste. Add salt and pepper to taste and that’s it! How easy is that?! Served with a simple green salad and homemade naan. Oh, I almost forgot to mention chutneys. Mango chutney for sweetness and mint chutney for heat. Those are two must-have items in my family when we have curry. Vegetables I used are zucchini, red bell pepper and broccoli. 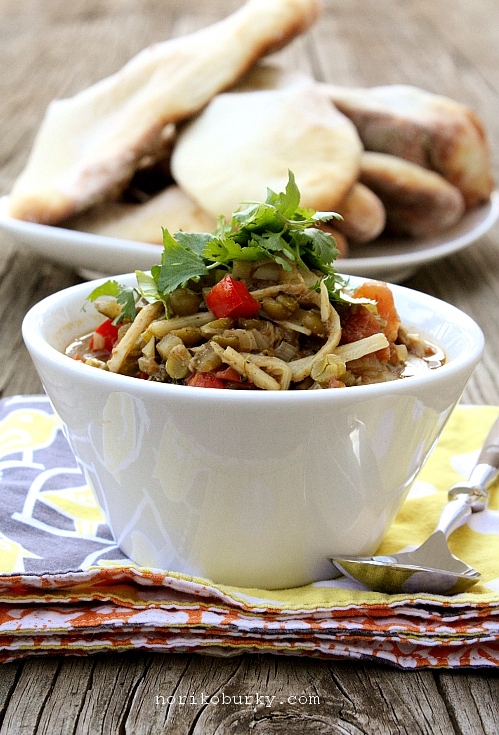 Tons of veggies and peas cooked with appetizing spices. The total amount of oil I used is 2 tablespoons for yield of 4-5 people. Not bad, huh? Thanks for reading and hope you have a terrific weekend!!! This entry was posted in Entree, rice & grains, vegetables. Bookmark the permalink.